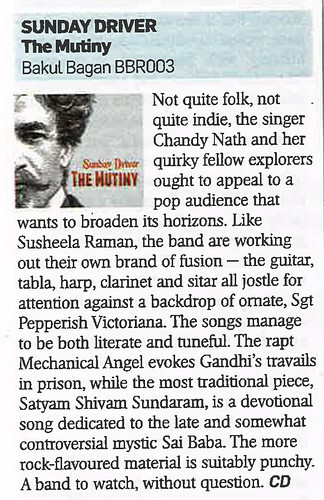 Totally stoked to see this review of the new Sunday Driver album The Mutiny – out now!!! – in the Sunday Times Culture magazine this weekend (page 35 if you’ve got it to hand). This was a perfect topping to an amazing couple of weeks in which we hit our Pledge campaign target, played an incredible album launch gig at Hoxton Hall, and made our debut at White Mischief at the Scala. Can I sleep now, please? This entry was posted in Music, Reviews, Sunday Driver. Bookmark the permalink.